Travel north on Highway 102 to Truro, and take Exit# 15W for Highway 104 West. Continue on 104 West until Masstown, Exit # 12. Turn right at the four-way intersection at the end of this exit and look for signs for Highway 2 North to Parrsboro via Great Village, Bass River, Economy and Five Islands. In Parrsboro, Route 2 becomes Eastern Avenue. Continue straight onto Main Street and turn left onto Two Island Road at the brick building with the clock tower. The Fundy Geological Museum is at the end of the third driveway on the right side of the road, 162 Two Island Road. Travel West on Highway 104 to Masstown, Exit # 12. Travel East on Highway 104 to Amherst, and take Exit #4, then follow Highway #2 South about three kilometers to the flashing yellow light in Nappan. Turn right onto Highway 302 to Southampton where you re-join Highway #2 South. Look for signs to Parrsboro and the Fundy Geological Museum. In Parrsboro, Route 2 becomes Upper Main Street. Continue straight onto Main Street and turn left onto Two Island Road at the brick building with the clock tower. 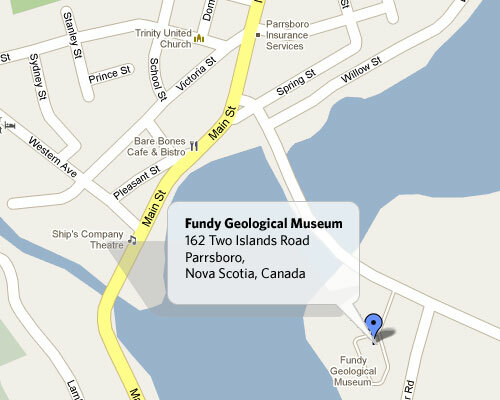 The Fundy Geological Museum is at the end of the third driveway on the right side of the road, 162 Two Island Road.